44 ⅞ x 68 ⅞ in. Scenes of music parties, like this one by Theodoor Rombouts, were common among Flemish artists of the 17th century. 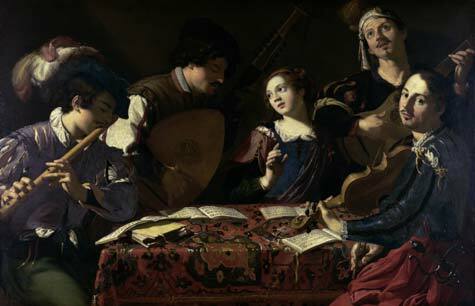 Here, Rombouts used dramatic lighting to highlight various features of the musicians, who gather around a central table. These features – ear, nose, hand, and eye – correspond to four of the five senses. Rombouts studied the work of Italian artist Caravaggio (1571 – 1610) when he lived in Rome. Rombouts’ use of bright light and deep shadows recalls Caravaggio’s similar dramatic lighting effects.